Saturday morning my wife helped me haul the dresser upstairs. She's pretty strong but the dresser is also pretty heavy. I haven't weighed it yet but I'd guess it is over 100 lbs and quite bulky. With a little grunting - mostly from me, my wife is too polite to grunt - we got it upstairs to the finishing room without hurting ourselves, the house or the dresser. All-in-all successful in my opinion. I'd already taken my saw ponies up to the finishing room and laid them out. 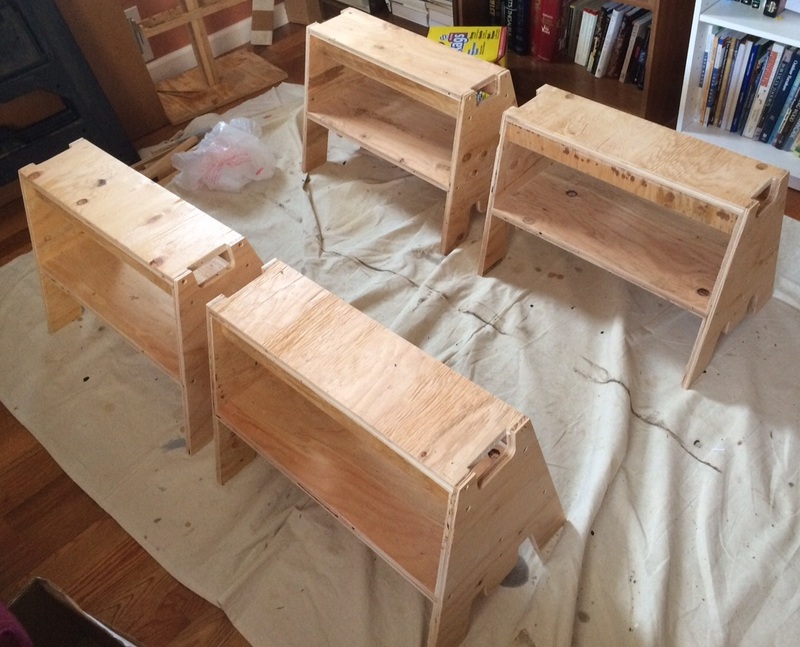 Since I didn't want to get danish oil all over them - pools of danish oil tend to stay sticky - so I covered them up. 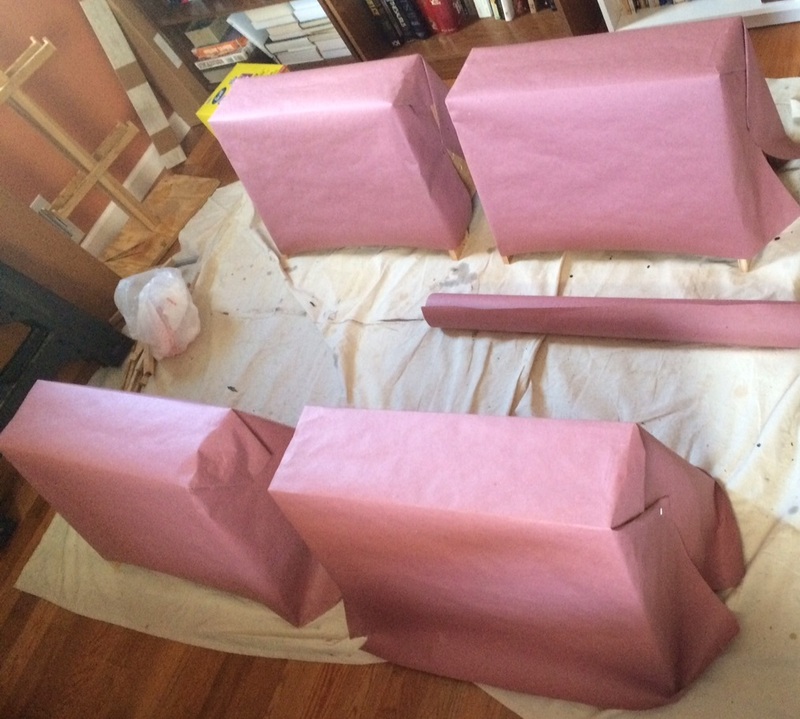 The pink paper is actually underlayment for hardwood flooring. It isn't too expensive and it does a good job of absorbing spills. 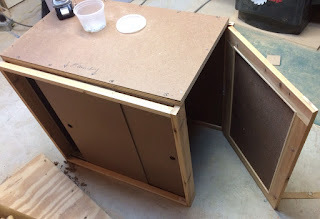 I use it to cover my workbench when I am doing glue ups. 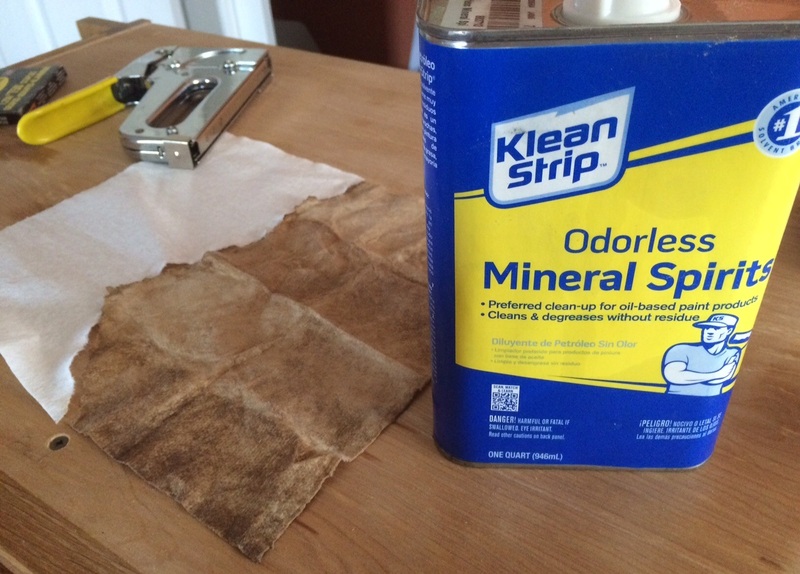 Before carrying the dresser upstairs I'd brushed the bulk of the dust off the dresser and after getting the dresser upstairs I wiped the dresser down with mineral spirits. This does a few things: it gets the last of the dust off, it highlights the grain and it helps me find places that need a little more sanding. Mostly it gets the last of the dust off. You can see from the towel I used how much dirt and dust I got off the dresser. Next was just tipping the dresser onto the saw ponies. I originally thought I'd leave it on its back but I was worried about reaching the back. After I lifted it upright I realized I could still reach everything I needed to and additionally I would not have to reach over the sides to get to the insides. After wiping a project down with mineral spirits I like letting it sit for 24 hours to let the mineral spirits finish evaporating. I don't want to risk polluting the finish I'm putting on over it. This means the dresser case needs to sit until Sunday. My style of finishing takes a lot of clock time but very little personal time. There is a lot of sit and wait - or in my case go do something else. As I was heading down to the workshop to make the top of the dresser my wife reminded me I was going to make a wooden plinth/base for one of her miniatures. So I futzed around with figuring out what I was going to do for her and then promptly forgot to take the wood blank down to the workshop with me. I found it when I came back upstairs for dinner. 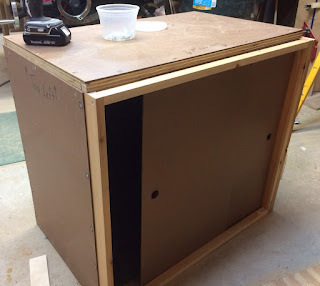 Then when I got into my workshop I saw the start of the 3D printer enclosure I'd started earlier this week. That distracted me yet again. Building the enclosure was kind of fun since I didn't have a plan and just worked it out as I went. I made pretty good progress Saturday afternoon until I had to quit and clean up for dinner. Sunday when I got back in the shop I finished the door that goes on the right hand side. I wanted to try a couple of things I don't do very often so I made the door with half lap joints. I put a dado around the inside of the door frame then used stops I nailed in place to hold an MDF panel in the door. I did this so if my friend - we'll call him Tyler to preserve his anonymity - ever wants to put glass or plexiglass in the door he can replace the MDF panel. It looks great for being made out of spare parts I had lying around and no real plans. I had three 1"x3"x8' pine and a 4'x8' sheet of 1/8" MDF. There's only one problem. I made it using the outside dimensions of the table the printer is sitting on and the height of the printer. When I double checked my resulting inner dimensions the box is about 3/4" not deep enough. The printer will fit behind the front sliding doors but not within the footprint. I think I can make it work by giving my friend 'Tyler' a base to lift the printer over the lip created by the sliding doors. 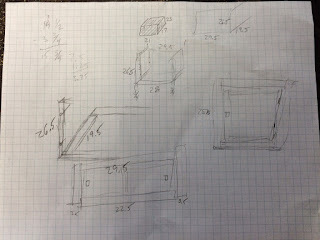 The Plans! Parts, ready for delivery! After I finished the enclosure I whipped out a base for my wife's figure made out of red oak. 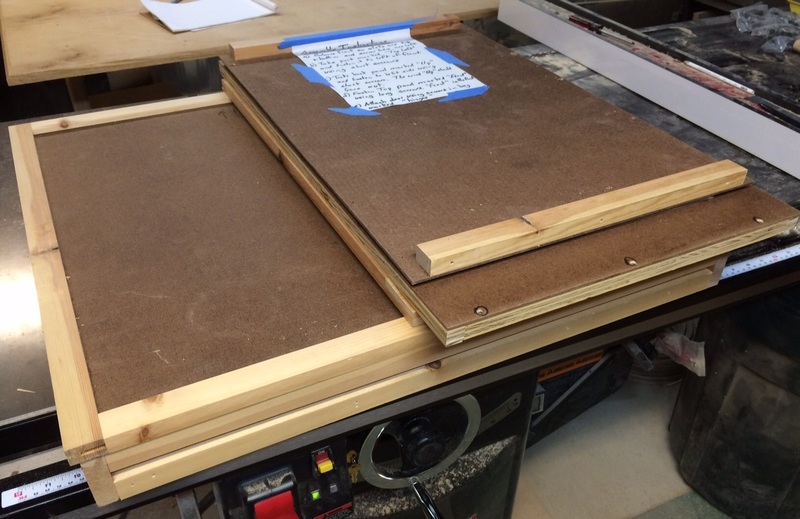 It basically just consisted of cutting it to size then running it past a router to shape the edges. It ended up a little bigger than my wife wanted but it'll do. I got a lot done this weekend, but almost none of the stuff I'd planned. Of my goals I got half of the first one done. 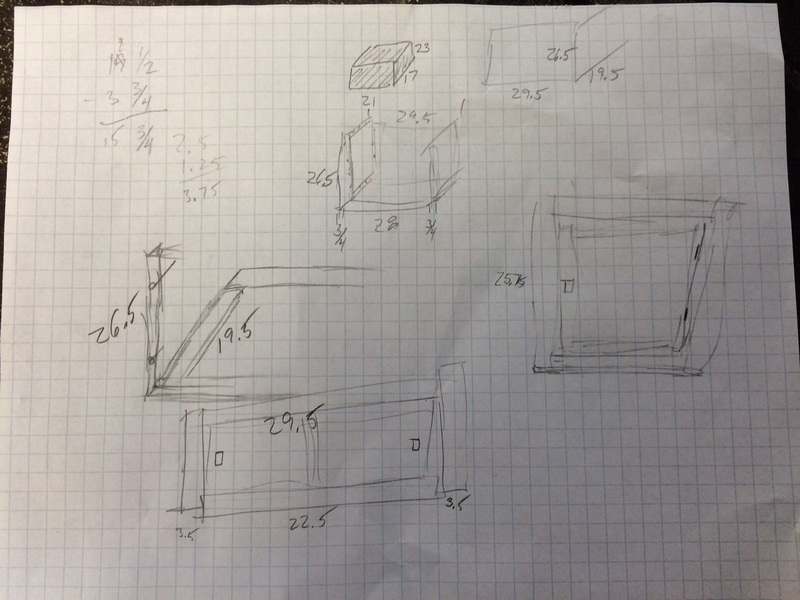 My woodworking is much like going grocery shopping. You start off with a list and then halfway through the store you remember that you needed yogurt and something for dinner tomorrow night so you pick those things up too. 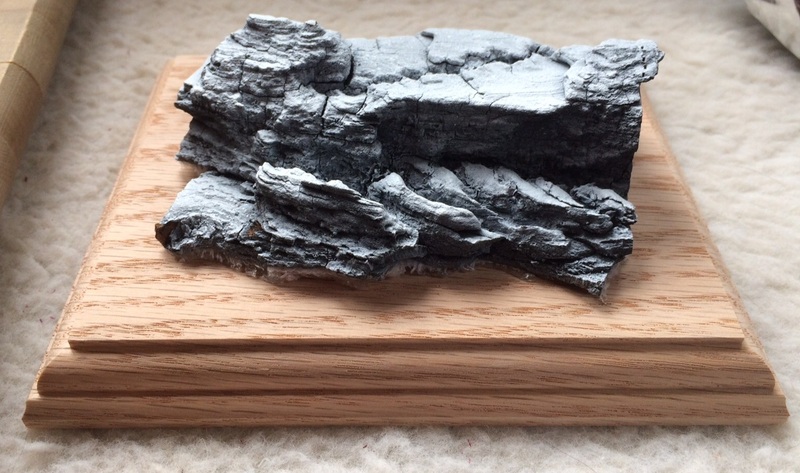 I got my wife's base done so she can enter her mini in a competition at Adepticon. I finished an enclosure for a 3D printer for my friend. I did get my dresser upstairs and cleaned up ready for the danish oil. 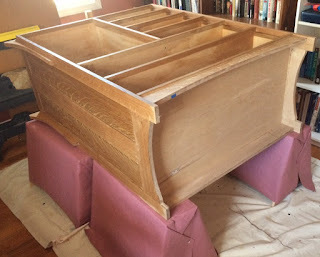 I'm not too bothered by not getting the rest of the dresser work done this weekend because there is going to be so much waiting for finish to dry over the next few weeks that I'll have plenty of time to do the other stuff. 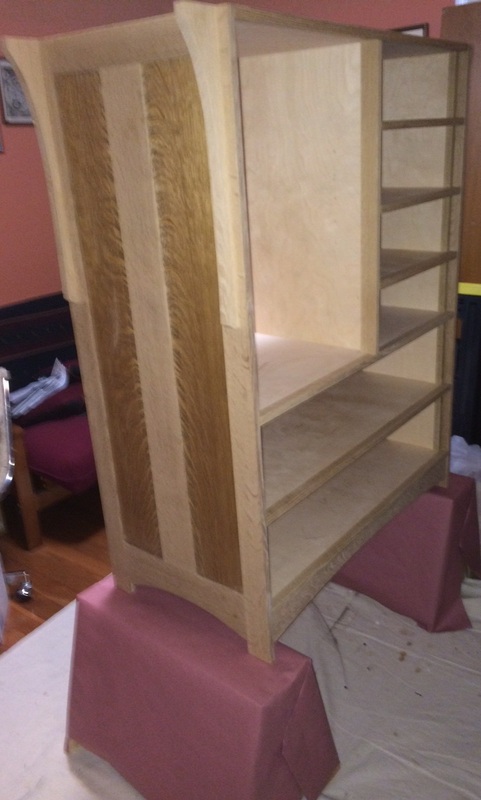 I'll probably do the Danish Oil tomorrow night and it'll be fine.